As I was driving from Malaga to Cadiz for the unveiling of the first full-scale Hyperloop capsule, I got stuck on a simple math problem: “If it takes me two and a half hours to travel this 150-mile route, then the Hyperloop would take...” Oh, what does it matter? The road is steep and the chances that someone will build a giant tube between both cities are scarce, at least in my lifetime. Then all of a sudden, I ran into a thick fog—courtesy of the Strait of Gibraltar—and thought: “Well, this is the perfect metaphor for the Hyperloop. No one knows what’s next or where the limit is.” Now that I have seen it in person, I am even more uncertain about its future. Just like the idea of electric cars, the idea of a train traveling at very high speeds through a tube is more than a century old. 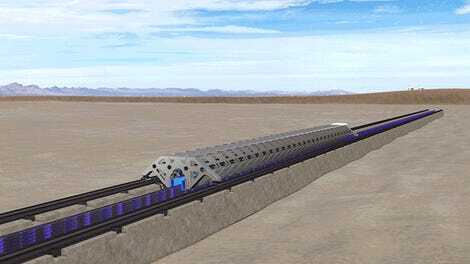 On a similar note, the idea of a train that travels through a tube at high speeds and is economically viable, just like economically accessible electric cars, is attributed to Elon Musk. He was the one who introduced the concept in 2013. To remove air resistance, he proposed emptying the tube with vacuum pumps. To remove the friction between the train and the tracks, he proposed a capsule that levitates on air bearings, like an air hockey table where the air comes out of the puck instead of the table. He then added some linear induction motors and described the thing as “a cross between a Concorde and a rail gun.” He called it The Hyperloop, but then he said he was too busy leading his companies to take care of this and encouraged anyone interested in building the concept to give it a try. Thus, with a 57-page white paper sketched by Tesla and SpaceX engineers, the largest open source hardware project in history was born. Hundreds of students and entrepreneurs started working on the first Hyperloop concepts and simulations, but only two companies got enough funding to build something more tangible: Hyperloop One and Hyperloop Transportation Technologies (HTT). Leading operations for HTT is Bibop Gresta, an Italian investor Wired described as “an exuberant showman with a Tony Stark beard and a Muppet’s rhythmic laugh who aspired to be a rapper in his youth, toured briefly as a stage performer and had a short TV career presenting on Italian MTV.” Gresta did not speak well of Hyperloop One when he talked to Wired and even accused them of plagiarism: “They are copying everything, [even] the logo.” In reality, both companies have been making some progress: Hyperloop One was the first to test a scale model of its capsule in Nevada and HTT was the first to unveil a real Hyperloop capsule in Spain. “We own the Hyperloop brand in 57 countries, but we like competition,” said Gresta in a conciliatory way when I asked him about Hyperloop One. HTT invited Gizmodo to have breakfast with its founders a few hours before the grand event. I arrived at 8:30 and sat at the table with Bibop Gresta, whose real name is Gabriele. I noticed the perfectly shaped beard, the sterile smile and the lifted flaps on his suit. He didn’t like that I was recording the conversation, but he agreed. Musk’s Hyperloop had an air compressor to distribute the pressure within the capsule and to cast air below its skis in order to glide. This was designed to avoid using magnetic levitation—an existing technology that would have led to prohibitive costs on long routes—but it was inefficient and it would have punished passengers with a hellish noise. HTT engineers studied their options and chose Inductrack, a passive magnetic levitation technology created in the 90s by researchers at the Lawrence Livermore National Laboratory in California. Unlike active magnetic levitation, Inductrack doesn’t need electromagnets or any power to achieve the levitation effect. The lower part of the capsule has a matrix of permanent magnets that are oriented in a way that generates a magnetic field opposite to the coils that are arranged on the track. If it’s still, the capsule does not levitate: it rests normally on the track. But with increased speed, the magnets induce a voltage in the coils that ends up raising the capsule without using any active elements, which would be much more expensive. This technique reduces friction, but does not move the system; that’s what linear motors are for, and they take their energy from batteries that travel inside the capsule, like an electric car. Elon Musk said you could use solar energy to move the capsule, I recalled. “We use a combination of renewable energy from solar panels on the upper part of the system, kinetic energy from the movement of the capsule and regenerative braking,” said Gresta. “In contexts where solar energy is not efficient, we use geothermal energy,” he said. “The combination of these elements creates 30 percent more energy than we use.” The businessman speaks in present tense, but everything that he says takes part in the future. What HTT has made, for now, is the naked body of a capsule; without motors, without magnets, and without seats. For Carbures, on the other hand, giving form to Priestman’s drawings was such a complicated task that their employees worked for months without taking days off, except on weekends. “I’m grateful to the people that didn’t go on vacation to make this possible, that’s a big deal in Spain,” Dirk Ahlborn said during the event. “That’s a big deal all over the world!” said the smiley presenter of the event to smooth tensions. The same day Quintero One was unveiled, Carbures changed its name to Airtificial. The company born from the University of Cadiz—which has manufactured carbon fiber parts for Airbus and Boeing—finished cleaning up its accounting records last year after a long economic crisis that hit bottom in 2013, when its shares collapsed and were suspended at the stock market. Its founder, Rafael Contreras, is also the cofounder of Muving, a motorbike sharing service that invaded several cities in Spain and is now available in Atlanta. Another face of the company is Ramón Betolaza, the Spanish investor who rescued Carbures when it was in debt and now is part of the board at HTT. HTT and Airtificial invested a total of 21,000 engineering hours and 5,000 assembly hours to create Quintero One, a five-ton capsule made of 85 percent carbon fiber; or, as HTT puts it, 85 percent Vibranium. The material that covers the capsule takes its name from the Marvel universe, but it doesn’t come from Wakanda: it is a double-layered patented-design that uses 82 panels of carbon fiber and 72 sensors able to detect problems related to the structural integrity of the vessel, which at close to the speed of sound is especially interesting. The capsule is 105 feet long, half of which are used for the passenger cabin, which has space for about 30 people. The name Quintero One honors Andrew Quintero, a space scientist who founded JumpStartFund along with Dirk Ahlborn, but died in a swimming accident in 2014. JumpStartFund is a collaborative incubator where people from all over the world can help you build your startup. HTT was born when Ahlborn uploaded Elon Musk’s white paper to JumpStartFund and more than 800 volunteers, including engineers from NASA, SpaceX, and Boeing, started working together on the first Hyperloop. From their homes, in their free time, they carry out simulations and share ideas about the materials to work with, but they do not get a salary: they are paid in stock options. “It’s an incredible model to build the companies of the future,” says Gresta. “A model that’s taught at Harvard University since 2017.” It is also an insufficient model: in addition to the volunteers (officially called “contributors”), HTT has a central team of employees with traditional contracts. When I finally arrived at Airtificial, which had just taken down the Carbures logo from its facade, a couple of policemen inspected me with their eyes. It did not take me long to find out why they were there: several politicians attended the event, including the president of Andalusia and some representative from the Ministry of Industry in Spain. Is there any public money involved in the manufacture of this capsule?, I asked. “No,” said Dirk Ahlborn. But, again, we are talking about the future. In Cadiz, the only thing that was unveiled is the skeleton of a promise. There was a countdown, there was some epic music played and then a curtain fell. Before a crowd of politicians, investors, and journalists, the Quintero One appeared, a silver capsule with a more austere design than the drawings made by PriestmanGoode. Maybe because I waited five years for this moment, maybe because its interior was empty or maybe because they are making a windowless magnetic levitation train instead of the unrealizable concept introduced by Elon Musk, I felt a slight disappointment. The company neither allowed me to take pictures of the empty cabin nor talked much about its future design. When I set foot inside of the capsule, instead of the “fifth transport revolution” I felt I was inside a tube of toothpaste. What will the interior of Quintero One be like? Gresta told me that they had been thinking about safe and comfortable materials like Kevlar, Priestman said that it will be a “completely different experience” from what we know. Will it be comfortable for passengers? I asked. “It should be comfortable, yes,” the designer replied. The user experience is in such an early phase of development that Dirk Ahlborn told me the tickets would be free, supported with advertising, and Gresta talked about a payment system using blockchain and biometric sensors. “In any case, if the ticket costs 30 dollars we would recover the initial cost in eight years,” Ahlborn explained. Quintero One will now move to a development center in Toulouse, where the rest of the capsule will be assembled. HTT says it will be ready in 2019, but the capsule itself is only a small part of the system. The real difficulty will be building the low-pressure tube where the capsule will travel; not only because it will take hundreds of vacuum pumps to extract air from point to point, but because the morphology of the terrain will rarely be a straight line. There will be turns, there will be climbs, and they’ll have to make the accelerations and decelerations smooth enough so that passengers do not vomit or lose consciousness along the way. This is where one of the great myths of the Hyperloop comes into play: the capsule will not travel at the speed of sound, nor at any other similar speed; they’ll have to adapt the speed to the morphology of the terrain or the capsule may fly away. I pictured a flying Hyperloop while traveling back to Malaga. “It’s like a plane without wings,” they said during the event. Airplanes travel at high altitudes to overcome wind resistance, but the Hyperloop will do it at ground level, so companies like HTT will have to develop a system that overcomes seismic movements and even the smallest rivet out of place or the result may be catastrophic. If they succeed, they would have created a more efficient transport for the future. Will they succeed? For now I can say that the real Hyperloop is quite different from the initial concept introduced by Elon Musk that had air bearings, supersonic speeds, and solar energy. But the brand remains. A brand that politicians find appealing—so maybe they’ll help make it a reality. The morning mist disappeared and now there was a blue sky, but my doubts about the Hyperloop were still there. There are still safety concerns, and the unveiling of a carbon fiber capsule really means nothing at all yet. The Gotthard Base Tunnel in Switzerland, which is the longest railway tunnel in the world, took eight years to complete and is only 94 miles long. With Hyperloop we’re talking about hundreds or even thousands of miles—a tube that in order to be built needs the consent of hundreds of farmers whose land lays in the way. I’ve seen the pointy, sleek “face of Hyperloop,” as Priestman called it, but appealing or not, the actual tunnel will have to adapt to reality.